Be the first to start the winter in the Kitzbühel | Kirchberg ski area! The Kitzbühel | Kirchberg ski area is absolutely one of the first non-glacier ski areas to get the winter season under way – on Saturday 13th of October the Resterkogel / Resterhöhe area opened for business; on daily base from October 21st. The ultra-modern Kitzbüheler Alpen Panoramabahn cable car is the quick, easy and direct way to ascend from Breitmoos (middle station) and start enjoying all the fun of skiing. Once at the summit, you experience perfect snow conditions and top quality ski runs. The sun is shining brightly, the panoramic views of the mighty Hohe Tauern mountain range and countless 3,000 m peaks boost your spirits and the Resterkogel 4-seater chairlift ensures your skiing pleasures know no limits. 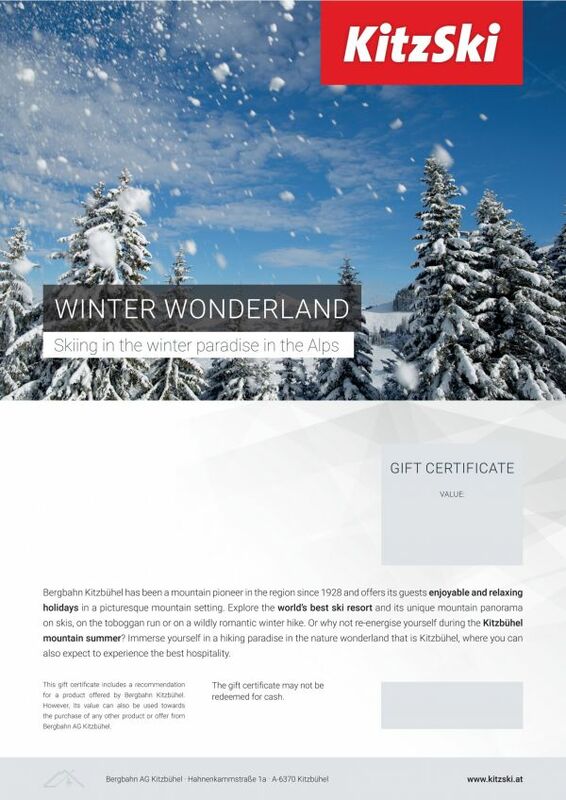 Give the gift of unforgettable moments in the Kitzbühel Alps by making use of our flexible vouchers or combined packages. What are you waiting for? Make somebody happy! 57 state-of-the-art cable cars and lifts and 230 spectacular kilometres of descents. Our ski area lies nestled between the Kitzbüheler Horn and Hahnenkamm. The Horn, Hahnenkamm, Fleckalm and Pass Thurn all feature perfectly groomed pistes, plenty of variety and, of course, cosy and rustic ski huts where you can stop in for refreshments and relaxation.